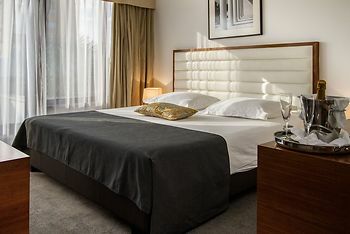 Atrium Hotel, Split, Croatia - Lowest Rate Guaranteed! When you stay at Atrium Hotel in Split, you'll be in a shopping district, within a 15-minute walk of Diocletian's Palace and Split Riva. This 5-star hotel is 1.8 mi (2.8 km) from Bacvice Beach and 3.1 mi (5 km) from Split Marina. We enjoyed this hotel because everything worked so well. Internet for our daily blog updates and speaking with family is very fast (we were even able to download some movies from iTunes), the room had all the things that a 5-star hotel should have (great beds, great pillows, perfect temperature and showers had goof water pressure). The rooms furniture is very welcoming and we looked forward to coming back at end odavid day trip and relax in our room. Breakfast buffet is weak with horrible coffee. Location is not ideal. Really nice hotel - only thing was that the location isnt that great... quite a walk from the city centre particularly in the evening if travelling alone.